YOKOHAMA, Japan, and LOS GATOS, Calif., December 7, 2011 - Fujitsu Semiconductor Limited and SuVolta, Inc. today announced that they have successfully demonstrated ultra-low-voltage operation of SRAM (static random access memory) blocks down to 0.425V by integrating SuVolta’s PowerShrink™ low-power CMOS platform into Fujitsu Semiconductor’s low-power process technology. By reducing power consumption, these technologies will make possible the ultimate in “ecological” products in the near future. Technology details and results will be presented at the 2011 International Electron Devices Meeting (IEDM) being held in Washington DC, starting December 5th. Controlling power consumption is the primary limiter of adding features to product types ranging from mobile electronics to tethered servers and networking equipment. The biggest contributor to power consumption is supply voltage. Previously, the power supply voltage of CMOS steadily reduced to approximately 1.0V at the 130nm technology node, but it has not reduced much further as technology has scaled to the 28nm node. To reduce the power supply voltage, one of the biggest obstacles is the minimum operating voltage of embedded SRAM blocks. By combining SuVolta’s Deeply Depleted Channel™ (DDC) transistor technology – a component of the PowerShrink platform – and Fujitsu Semiconductor’s sophisticated process technology, the two companies have verified that a 576Kb SRAM can work well at approximately 0.4V by reducing CMOS transistor threshold voltage (VT) variation to half. This technology matches well with existing infrastructures including existing system-on-chip (SoC) design layouts, existing design schemes such as body bias control, and existing manufacturing tools. Following scaling law, the power supply voltage of CMOS has been reduced progressively down to approximately 1.0V at the 130nm technology node. However, power supply voltages have remained at around 1.0V even though process technologies have continued to scale from 130nm to 28nm. Since dynamic power is proportional to the square of supply voltage, power consumption has become a primary issue for CMOS technology. Scaling of supply voltage stopped at the 130nm node because of multiple sources of variation including random dopant fluctuation (RDF). RDF is a form of device and process variation resulting from fluctuations in the concentration of the implanted dopant or impurity atoms in the transistor channel. RDF results in variation in threshold voltage (VT) between different transistors on a chip. Successful reduction of RDF has been reported using two exotic structures, ETSOI and Tri-Gate – a FinFET technology. However, both ETSOI and FinFET technologies are complex, making them difficult to match with existing design and manufacturing infrastructures. An implementation of SuVolta’s DDC transistor on Fujitsu Semiconductor’s low-power CMOS process is shown in figure 1. The cross sectional transmission electron micrograph (TEM) shows the transistor fabricated on a planar bulk silicon structure. For most chips, lowering supply voltage is limited by the SRAM. Fujitsu Semiconductor and SuVolta have demonstrated an SRAM macro functional even at 0.425V, as seen in figure 2. 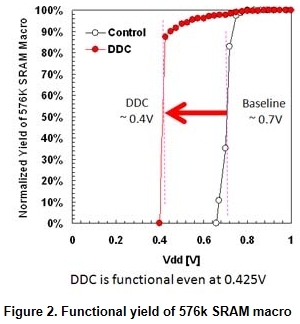 Since SRAM is the most challenging circuit for supply voltage reduction, the verification implies that DDC could enable approximately 0.4V operation across a variety of CMOS-based circuits. Figure 2 shows yield of 576k SRAM macro as a function of supply voltage. The yield is calculated by counting macros in which all bits have passed. The process flow for DDC transistors has been successfully established. 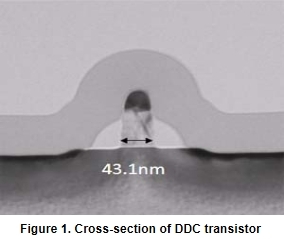 Fabricated DDC transistors demonstrate a 50 percent reduction of VT variation from the baseline flow, and deliver functional SRAMs even at 0.425V. These show the DDC transistors’ capability to reduce supply voltage down to ~0.4V. Fujitsu Semiconductor is going to advance the technology and aggressively respond to customers' requests for low-power consumption and/or low voltage operation in consumer products, mobile devices and other offerings. Fujitsu Semiconductor Limited designs, manufactures, and sells semiconductors, providing highly reliable, optimal solutions and support to meet the varying needs of its customers. Products and services include microcontrollers, ASICs, ASSPs, and power management ICs, with wide-ranging expertise focusing on mobile, ecological, automotive, imaging, security, and high-performance applications. Fujitsu Semiconductor also drives power efficiency and environmental initiatives. SuVolta, Inc. develops and licenses scalable semiconductor technologies that enable a significant reduction in IC power consumption while maintaining performance. Based in Silicon Valley, the team includes world-class engineers and scientists with a long history of technology development and innovation to advance the semiconductor industry.